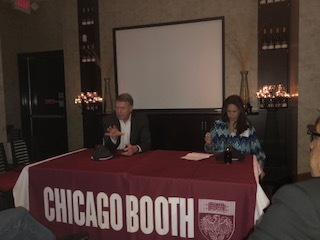 Last night your editor had the pleasure of meeting and interviewing Matt Feguson, guest speaker at the Atlanta chapter of the Univ of Chicago’s Booth Business School. His easy manner and clear command of the Internet of Things (loT) was insightful. Matt is co-author of “The Talent Equation.” An award-winning leader who has always challenged the status quo, Ferguson took CareerBuilder to the No. 1 position in online recruitment within five years. Under his direction, CareerBuilder has evolved into a global, end-to-end human capital solutions company that outperforms competitors in both technology innovation and revenue. Using bold strategies, Ferguson spearheaded CareerBuilder’s transformation from a recruitment giant to a powerhouse in both pre-hire and post-hire solutions. He introduced a new vision for advertising, software and services that has changed the way companies acquire and manage talent. Our interest was the McKinsey Research indicating a major workforce disruption coming soon through use of artificial intelligence to replace human labor. Matt was more sanguine, and felt what does come will “wrap around” existing work and complement rather than replace existing jobs. Interesting enough, Matt worked early in his career for McKinsey, a fact reflected in his vision of the topic. A graduate of the Northwestern law school, Ferguson made light of having attended Chicago’s “other school” (v. Booth). Career Builder (CB) provides a wide range of hiring services including background checks, software sales, teaching systems, data analytics re- and up-skilling, and, yes, artificial intelligence (having just acquired an Amsterdam purveyor). Some facts -the three most important criteria to new hires in order are job location, its pay, and the length of their commute. Of CB applications, 60% come in via mobile phone whereas just last year it was 40%. 33% have a 4-year college degree, 67% do not, and 43% of those starting college do not complete studies within 6 years. Matt sees the future of internet usage as compressed going forward, fewer Gig workers and fewer employees that 10 years ago, and, to our regret, noted less entrepreneurship today than ever before. At time when entrepreneurship can be a partial solution for workforce displacement by robotics and artificial intelligence, the latter is concerning. The editor feels there has never been a more important time for basic, widespread training for entrepreneurship. It will become, in our opinion, a survival skill needed to fill the space when displaced workers are looking for new jobs. They will in essence do best by creating their own jobs. Ferguson saw marketing as an area of opportunity through defining markets more narrowly and targeting good and services closer to the customer. He feels big Tech will serve all us better by following the European model of restraints and definition. Employees need to become life-long learners. College degrees by themselves will no longer earn more salary, but need training in specific niche skills. Post secondary schools should funnel students into specialties that fit outcomes individual seek. To saddle students with large debt and not result in a skilled outcome at the end (sociology, psychology majors were mentioned) won’t work in the future. Matt cited the work of Mitch Daniels after service as Indiana governor while President of the University of Indiana as a great example of alignment studies to outcomes. Per Ferguson the future is quite good for jobs. There is demand for highly skilled labor, and the best fields for study are tech and finance. Sales and marketing will always be needed. Advertising should be targeted to match a business’ inventory. Artificial intelligence (AI) can help take bias out of employment positions. All in all, Matt’s address was hopeful. Clearly, Career Builder has an enlightened leader at the top, who will stay current to employment changes and technological improvements. .